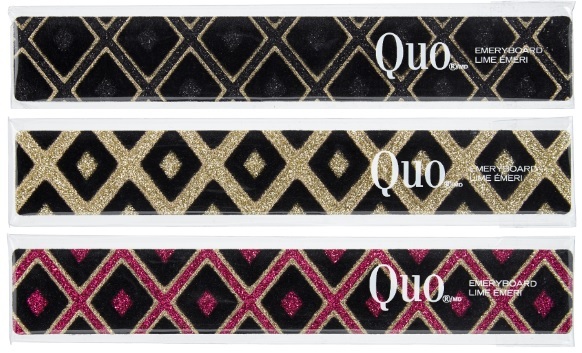 Quo Christmas Cracker Set - $15 - set of 3 beauty surprises - crack them open to reveal a mini lip gloss and mini eye shadow. Quo Rich in Beauty Palette - $38 - contains 30 eye shadows, 10 lip glosses, 4 blushes, 4 face colours, 2 black mascaras, 2 eye liners and applicators for endless makeup possibilities. Quo Back to Basics Palette - $25 - includes 12 gradient eye shadow shades including light, neutral and darker, smokey shades along with a full-size eye shadow brush. Quo Beauty on the Go Palette - $15 - a sleek compact holding 3 lipsticks, 3 eye shadows and 1 blush as well as applicators for them - perfect for your on-the-go holiday makeup needs! Quo All About Eyes Palette - $22 - mix and match 10 expertly selected shades for endless options that go from day to night. Quo Essential Eyes Palette - $15 - with the four most needed shades for the perfect neutral eye! Quo Smokey Eye Palette - $5 - in brown, glitter and purple which includes 5 complimentary shades to create the perfect smokey eye. Quo Shimmering Body Powder - $20 - for the perfect holiday glow for your face, hair and body. Quo Mini Lip Gloss Tower - $10 - includes 6 mini glosses. Quo Master Brush Set - $60 - features an exclusive offering of 10 beautifully crafted Quo cosmetic brushes including a deluxe bag to store and protect them. Brushes included are: Powder, Blush, Foundation, Concealer, Lip, Liner/Brow, Crease Blender, All Over Shadow, Definer Shadow and Shadow Smudger brushes. Quo Precious Tools Brush Collection - $25 - includes a blush, foundation and 3 double-ended eye shadow brushes all housed in a convenient travel-friendly black sparkle case. Quo 10-Piece Mini Brush Set with Roll - $45 - includes 10 travel-size brushes housed in a black cosmetic roll. Brushes included are: Powder, Blush, Foundation, Concealer, Lip, Liner/Brow, Crease Blender, All Over Shadow, Definer Shadow and Shadow Smudger brushes. Quo Travel Mini Brush Set - $15 - a multi-purpose 4-piece brush set designed to create on-the-go beauty looks. The gold designer case holds a blush, shadow, concealer and brow/liner brush. Quo Men's Manicure Set - $15 - all the essential tools for keeping nails in great shape including: toe nail clipper, nail clipper, nail file and scissors. Quo Ladies Manicure Set - $20 - a complete collection of grooming tools including: nail clipper, toe nail clipper, cuticle nipper, nail buffer/file, scissors and slanted tweezers. Available exclusively at Shoppers Drug Mart - coming soon if not already available! Ooh looks like some real treats this year! The Back to Basics palette looks really nice! Those eye palettes look good! Last year everything sold out so quick so I'll be sure to check out my shoppers next weekend!